I'm excited to be back! Now that the Christmas is put away and the baby shower over (more on that later) it is now time to start thinking about Valentines Day! 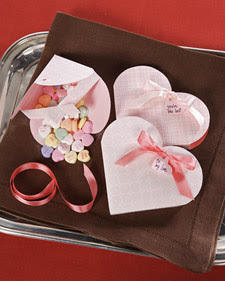 So to start off I found this really cute tutorial from Martha Stewart on how to make Treat Boxes for those sweet treats that you will be handing out. Go to the Martha Stewart website to check out this fun tutorial!